Smartphone shipments increased 38.4% in 2013 topping one billion units worldwide, with Samsung taking the lead. 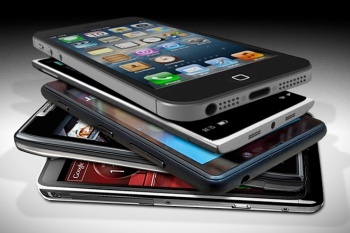 More than one billion smartphones were shipped globally last year, according to the International Data Corporation. Totaling 1.004.2 million smartphones across multiple vendors, this is the most units shipped in a 12 month period to date, which is an increase of 38.4% from 2012's 725.3 million units. Out of all the vendors, Samsung nabbed the top spot moving an impressive 313.9 million smartphones in 2013, that translated to a slight increase of its market share from 30.3% to 31.3% from the previous year. Meanwhile, its closest competitor, Apple, is at second place with 153.4 million units shipped, but according to IDC's data, Apple's smartphone market share dropped from 18.7% in 2012 to 15.3% last year. Apple's market share dip was taken over by Asian companies Huawei (48.8m units), LG(47.7m) and Lenovo(45.5m), with all three companies almost doubling their 2012 smartphone shipments in 2013. Additionally, IDC's report also shows that for the first time, smartphones accounted for the majority of mobile phone shipments finishing with 55.1% of all mobile phone shipments in 2013 -- an increase from 41.7% compared to 2012. IDC Program Director Ryan Reith states, " top trends driving smartphone growth are large screen devices and low cost," but also adds, "Of the two, I have to say that low cost is the key difference maker. Cheap devices are not the attractive segment that normally grabs headlines, but IDC data shows this is the portion of the market that is driving volume. Markets like China and India are quickly moving toward a point where sub-$150 smartphones are the majority of shipments, bringing a solid computing experience to the hands of many." Are you surprised that smartphone shipments have finally overtaken traditional mobile phones worldwide? I gather that with more companies offering cheaper smartphones in key markets, the numbers listed will go even higher in the next few years.